A thief has stolen people's coffees, and switched around the prices. Can you help the store manager? These people want a refund. 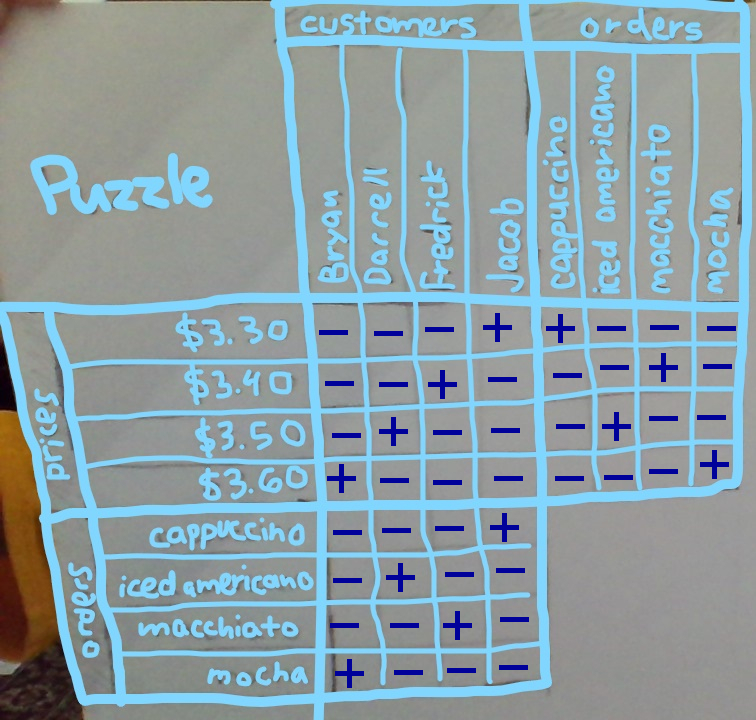 Try to find out which person ordered which coffee, and the coffees' cost. Unfortunately, they paid with cash, and they have very bad memories. The four orders were: the coffee Jacob ordered, the macchiato, the beverage that cost $3.50, and the mocha. The drink ordered by Darrell cost 10 cents more than the macchiato. The beverage that cost $3.30 was either the cappuccino or the coffee ordered by Fredrick. Of the drink Fredrick ordered and the drink ordered by Darrell, one cost $3.40 and the other was the iced americano. Bryan ordered the mocha for \$3.60. Darrell ordered the iced americano for \$3.50. Fredrick ordered the macchiato for \$3.40. Jacob ordered the cappuccino for \$3.30. 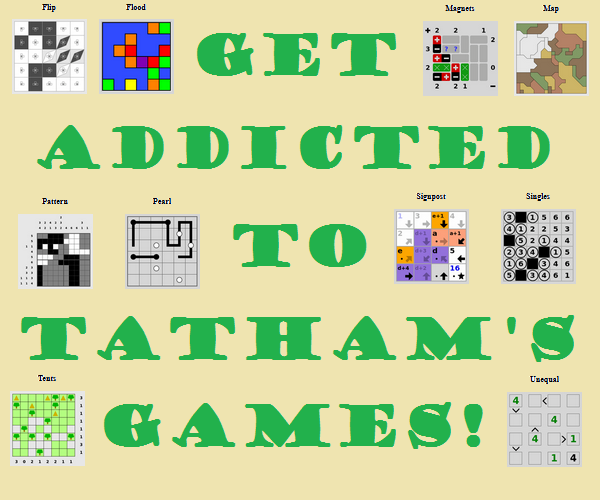 Here follows a step by step explanation how to solve the puzzle (and I now drew my own grid for that). 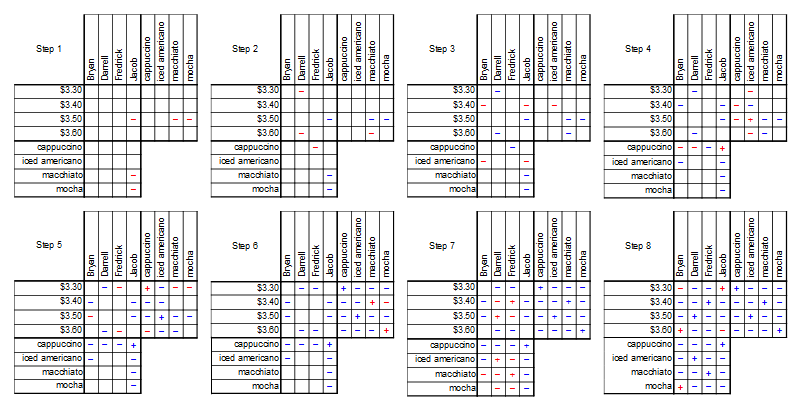 From the first statement we can exclude some combinations, because each given criterion belongs to a different coffee. From the second statement we know that the macchiato can't be the most expensive beverage. For Darrell's coffee are only the two prices possible, that are 10 cents over the prices that are left for the macchiato. From the third statement we know furthermore, that Fredrick didn't order the cappuccino. The fourth statement tells us, that the \$3.40 price can only be for Darrell or Fredrick and likewise the iced americano. Also can't they be the same drink. Jacob must have ordered the cappuccino, as it is the only field left. So no one else can have the cappuccino and it cannot cost a price that has already a minus in Jacob's column. Then only the iced americano is left for \$3.50. Now that we know the iced americano costs \$3.50, statement 4 can be read as: Of the drinks ordered by Fredrick and Darrell, one costs \$3.40 and the other \$3.50. So to fullfill statement 3, the cappuccino has to cost \$3.30. For the macchiato only \$3.40 is left, which leaves \$3.60 for the mocha. 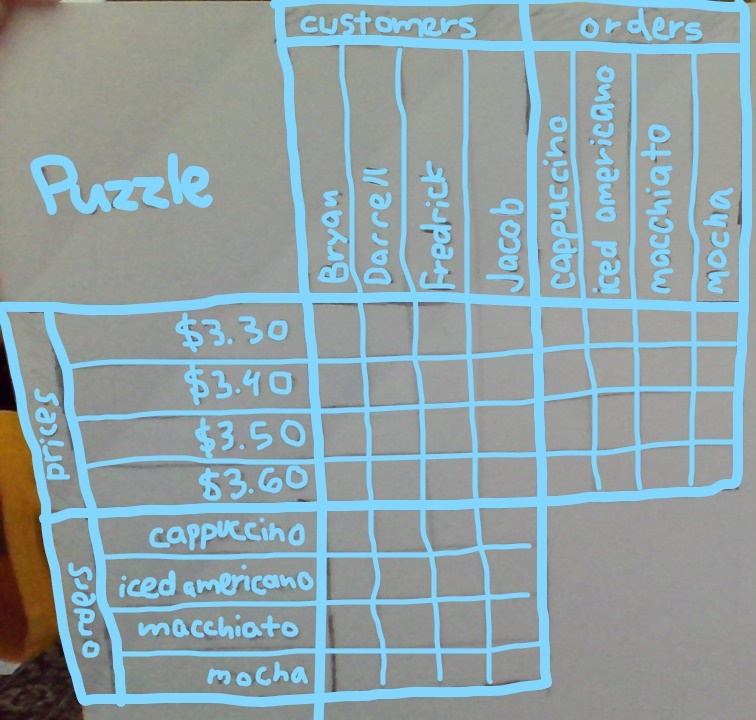 The macchiato costs \$3.40, so according to statement 2 Darrell's drink costs \$3.50, which is the iced americano. This leaves the drink for \$3.40 for Fredrick, which is the macchiato. We already know the cappuccino costs \$3.30 and was ordered by Jacob. Bryan can only have the mocha for \$3.60. Not the answer you're looking for? Browse other questions tagged logical-deduction logic-grid or ask your own question.